While it's easy enough to reap these benefits at home, the industry has naturally caught on—and now, we're seeing more and more unique options for those who want to take their interest in the matter to the next level. From sensory deprivation tanks to "salty yoga," we're counting down four different kinds of salt treatments we've tried ourselves—and whether they were really worth it. In all the years of my beauty guinea-pigging, floating in a sensory deprivation tank for two hours remains one of the most bizarrely gratifying things I've ever done—second only, perhaps, to getting a laser facial with my own blood. It's a strange concept to begin with: You lie in a tank of water that's saturated with a thousand pounds of Epsom salt, which in turn makes you completely buoyant. The water is heated to your body temperature, and it's completely dark and silent. It's said to mimic the womb, and the benefits abound: Your muscles completely relax, your stress ebbs away, and ideally, you enter a meditative state. But I was incredibly relaxed from the beginning and marveled at the fact that it really felt like I was in some kind of strange vacuum. And just when I thought that I had maybe hit the halfway mark of my session, someone shouted that it was time for me to get out—in reality, I had actually been in there for more than two hours. It was an extended kind of mindfulness I hadn't experienced before, and one that I sorely needed in contrast to my hectic life in the city. For the record, my persistent back pain also dissipated, and I slept like a baby that night. 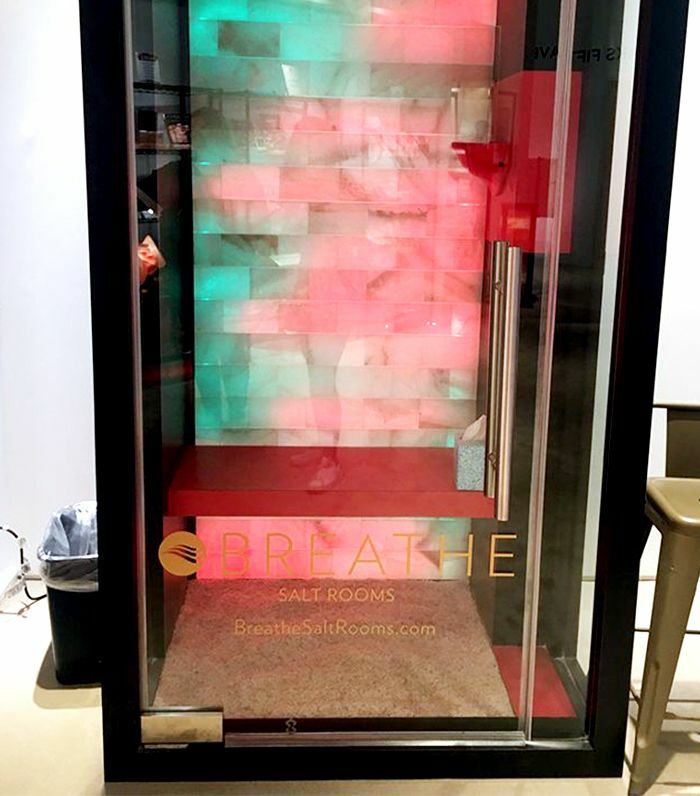 When associate editor Audrey Noble was feeling congested and under the weather, she decided to pay a visit to Breathe, a New York–based dry salt therapy center. Breathe offers an array of different treatments, classes, and workshops, usually inside actual "salt rooms" filled wall to wall with pink Himalayan salt. The point is to breathe in the salty air, also known as halotherapy. Because salt is antibacterial and anti-inflammatory, it's clinically shown to improve respiratory conditions ranging from asthma to a stuffed nose. It's also just a simple way to clear out and detoxify the lungs. Audrey opted for a solo treatment in one of the center's salt booths. Ten minutes did the trick. "As I stepped out, I realized whatever congestion I felt earlier was pretty much gone," she recalls. "But best of all, my headache had subsided, and I haven't had another one since." All that said, deeply inhaling the salty air while moving through restorative poses was just about the perfect antidote to a busy workday in New York City. Like Audrey, I left feeling incredibly cleansed and relaxed—and a little bummed that it was over. Accessibility isn't the only plus of DIY'ing a salt treatment at home—in truth, there are plenty of benefits to be had by adding some salt to a relaxing bath. Better yet, you can actually customize it to your needs and preferences, down to the type of salt you use. Many experts tout the benefits of Epsom salt, which is heavy in magnesium—the mineral can help soothe sore muscles and encourage deeper sleep. Others (like Shannon Vaughn, founder of Pursoma) prefer sea salt since it tends to carry a higher array of minerals than Epsom salt. 1. Drink two glasses of water before getting in the bath. 2. Soak for 20 to 30 minutes in the salty hot water. Looking for some more ways to breathe easier? Check out four natural remedies for spring allergies that we swear by.